FORT LAUDERDALE, Fla. A Florida judge refused Tuesday to grant a new trial, for now, for the alleged ringleader in an attack in which a teenager was drenched in alcohol and set on fire. But Broward County Circuit Judge Matthew Destry nevertheless left the door open for a second trial for 18-year-old Matthew Bent based on allegations of juror misconduct, including racial animosity. The judge plans to interview the jurors at an Oct. 12 hearing — exactly three years after the attack on Michael Brewer, who was then 15. Bent was originally charged with attempted second-degree murder. Two other teenagers pleaded no contest to that charge for their roles in the attack, but a jury in June opted to convict Bent of the lesser aggravated battery charge. He faces a potential 15-year prison sentence. Bent’s lawyers sought a new trial because the original trial judge stepped aside from the case before imposing a sentence. They said the new judge, Destry, should rehear the case because of questions of witness credibility and weak evidence. Destry disagreed, but said the issue of problems with the jury must be settled. “It needs to be resolved in order for us to move forward,” he said. Brewer’s mother, Valerie Brewer, said she was pleased with the ruling but disappointed that the case will continue. “It’s impossible to heal as long as we keep having to come back to court,” she said. Brewer survived by jumping into an apartment complex swimming pool but suffered severe burns over 65 percent of his body in a case that drew nationwide attention. Brewer testified that his scars are still painful and that he continues to undergo physical therapy. His mother said the family has kept the recent legal maneuverings from Brewer. “We have kept him in the dark. I don’t want it to disrupt all the positive things that are going on,” Valerie Brewer said. Trial testimony showed that Bent and Brewer got into a dispute the day before the attack. Brewer testified that Bent was trying to force him to buy a marijuana pipe, but Brewer refused. Prosecutors said Bent then tried to steal a bicycle from the Brewer home, which resulted in his arrest. 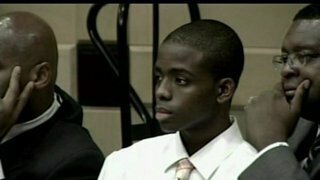 Fearing reprisals, Brewer testified he stayed home from Deerfield Beach Middle School. After school let out Brewer decided to visit a friend and happened upon Bent and a group of boys who had found a jug of rubbing alcohol at a nearby apartment complex. One boy poured the liquid on Brewer and another lit a lighter, setting him ablaze. Testimony was inconclusive on whether Bent signaled the attack. One teen testified that Bent offered money to those who would punch Brewer.